If you haven't started drinking bone broth yet then you're missing out. It is a powerhouse of nutrition, simple to make, and ultra-convenient. Plus, it provides health benefits. Is it the plentiful marrow? The abundant trace minerals? The glycosaminoglycans? The answer may be "Yes" to all those things, but according to some experts the biggest health benefit is found in the gelatin. Gelatin is a protein and is really just collagen which has been cooked. Collagen is naturally present in bones and tissue. Since gelatin is very high in glycine, this amino may be where much of the treasure is. There are several reasons why folks don't consume nearly as much gelatin as they did a hundred years ago, the biggest being the trend towards eating boneless muscle-meat on an almost exclusive basis. Yet it turns out that eating meat with the bone-in, consuming various organs, and also drinking bone broths regularly, results in a much more balanced diet which is relatively lower in trytophan/cysteine and higher in glycine/proline. This is how many ancient cultures used to eat. 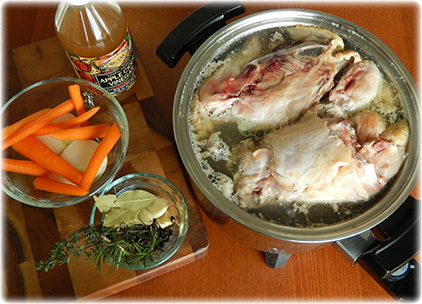 If you haven't made your own bone broth before, or are new to bone broth, consider starting with chicken. It's easy, delicious, and most people like the taste. Here I provide a simple recipe and easy instructions so you can get started. In this recipe I'm aiming for about two liters of bone broth, so I will use about 5 lbs of chicken frames (meaty ribs/backs). Notice that this is a ratio of a little more than two-to-one. That is, two pounds of bones for every one liter of bone broth. I find this is a good ratio in general when making bone broths. Some folks go lower (1.5 pounds for every 1 liter) or higher. The more bones you use, the more nutrients and gelatin you get. Some people add chicken feet to the broth in order to add more gelatin. That's good but our chicken feet sell out very quickly and you might not find them in stock. Don't worry your broth will still contain plenty of gelatin, since the bones in the chicken frames have plenty of collagen/gelatin, as does the skin. 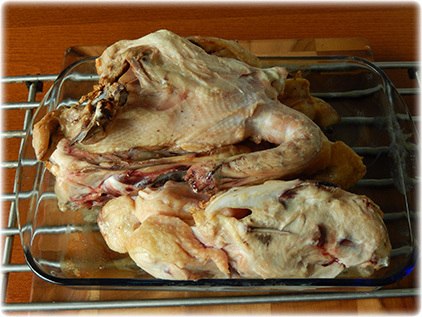 Or, you can use chicken necks as a substitute for feet, as they contain plenty of collagen as well. Start by roasting the chicken frames for about an hour in the oven at 350 degrees. This will release flavor, improving the taste of your bone broth. Taste is very important, not only as an indicator of nutrition but also as a way to make sure you enjoy your bone broth! Next, place the chicken frames into a slow cooker (you can also use a pot on the stove). Cover entirely with good clean unchlorinated water. Add a quarter cup of apple cider vinegar. Some believe this helps leach nutrients out of the bones, but I'm not sure that's proven. It doesn't hurt though, nor does it affect the taste so I use apple cider vinegar. It's very nutritious too! Leave the pot uncovered and raise the temperature enough so it starts to boil, then turn it down to simmer, so the broth barely moves. Continue to simmer on low heat for around 18 hours, topping up the water regularly to keep the bones barely covered. Take a wooden spoon and occasionally nudge around the chicken bones, breaking them apart and letting the nutrients seep out. Now add about 3 carrots cut in half, 3 white onions cut in half, several cloves of garlic, a teaspoon of pepper corns, and also some bay leaves and fresh thyme and rosemary, plus a little ginger. None of these ingredients are necessary, rather they are simply added for taste and extra nutrition. Continue to simmer for another 6 hours, topping up the water regularly. Just before you finish, add the sea salt. I use a little more than 1 teaspoon. The sea salt is important for taste, otherwise your bone broth will be bland. Your bone broth has been cooking for 24 hours which, for chicken, is long enough. For beef or pork you can go longer because the bones are denser. You will notice that the chicken frames are mostly disintegrated. Use a colander or strainer to remove the coarse ingredients. Then use a mesh cloth to strain it again, removing sediments and fine material. The liquid bone broth is now ready to cover and put in the fridge. After a few hours a thin layer of fat will congeal on the surface and you can skim it off. The remaining bone broth will have a slightly jiggly consistency which is due to the gelatin. 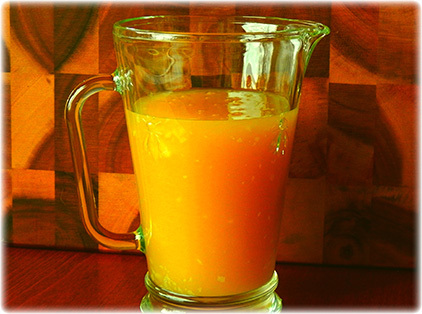 Chicken bone broth will generally be less jello-like than beef or pork broth, as the denser tissues of these species contain more collagen/gelatin. This is one reason I suggest people drink bone broth from multiple species, rather than just one. Your chicken bone broth is now ready to enjoy! You should have about 2 liters of chicken bone broth. If you have much more than this, you can put it back on the stove and simmer awhile longer. If you find you have significantly less than 2 liters, you may not have added enough water --- that's ok, your bone broth will just be more dense! Your bone broth will last in the fridge for up to 3 days, or you can freeze it. Drink it hot, and you will find the gelatin melts and your chicken bone broth will taste like chicken soup, only it will be very nutrient dense. Having a cup or two each day will be a meal or snack substitute which satisfies your appetite, nourishes your body, and provides you with a deep level of nutrition which I believe will produce lasting, measurable results. You can choose from a variety of our certified organic, certified humane, soy-free products to make your own nutritious bone broth.